Whats up to all you cats out there in the blogosphere. My name's Moose and Im gonna be helpin out Big Leks droppin only the choicest of jams for the good people of the world. To me, what the Jam and a Half blog is all about is allowing other people to share the connection that we feel with music. We´ve got the blessing to throw our favorite tracks up here of all different styles and genres to help people hear what they want to be hearin, or what they´ve never heard before. I love music but I aint no doctor so please if you have any comments or jams that you want us to posterize holler at us. That said, for my first jam I wanted to go with something that Ive been feelin real heavy right now, and that's Game Theory, the title track off The Roots seventh album circa 2006. 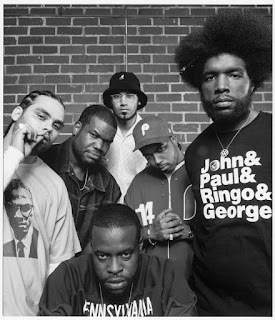 The Roots have been blowin up for a cool minute now, and Game Theory was both critically acclaimed and commercially successful. For a mainstream audience the album takes up a more serious tone than most of today´s current beats, and Game Theory sticks with this theme keepin the tone heavy and the lyrics real to their roots. This jam walks that fine line of casting some social commentary without getting on the political soapbox and soundin phony. In his first verse Black Thought explodes out the gates using a thumpin rythm to spark the track, and lets everyone know what Philly is really all about. Using a real classy Sly and the Family sample (Life of Fortune and Fame), and the irreplaceable flavor of The Roots band, the track builds an intensity that carries into each verse forcing the power of the rhymes on you. After a second rock solid verse from Black Thought, Malik B comes in smokin for the closer. Hittin rhymes within lines and spinnin street stories, the jam closes out as hard as it opens. Game Theory sets the tone for the rest of the album with a force that carries you through until the end, but this Jam and a Half has got everything it needs to stand alone as a classic track.